The Simms BugStopper SunSleeve is a sunsleeve by Simms that provides fly-fisherman with a sunsleeve that is made with UPF50 SolarFlex stretch fabric with Insect Shield Technology. 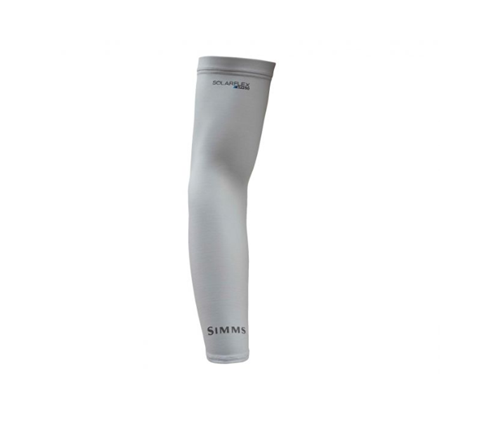 This Simms SunSleeve is designed to combat the sun while wearing short sleeve shirts, so you can easily wear this BugStopper SunSleeve with any of your most favorite short sleeve shirts, which is why these sunsleeves by Simms are becoming extremely popular in the fly-fishing community. The Simms BugStopper SunSleeve is lightweight and also provide quick-dry abilities and are also very breathable, which are really great qualities to have in a quality sunsleeve. The Simms BugStopper SunSleeve is also designed with elastic at the bicep and is curved at the cuff to provide better hand coverage. Also included with this Simms sunsleeve are pairing snaps at the bicep for storage. This SunSleeve is 17 inches in length and weighs in at just 3.2 ounces. So if you're looking for a quality SunSleeve, then make sure to check out this Simms BugStopper SunSleeve.